What’s left of the city of Singapore, Michigan is buried beneath the sand. In the early nineteenth century, three cities stood at the mouth of the Kalamazoo River in southwest Michigan: Saugatuck, Douglas and Singapore. Today, there are only two. Singapore is a ghost town where even the buildings are ghosts. Famous in its day for its lumber mills and shipbuilding, it gave up its life so Chicago might live. 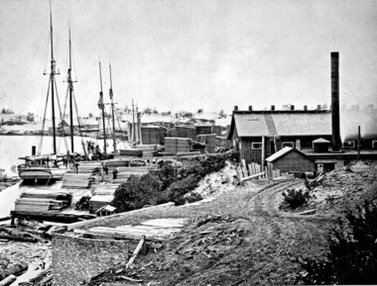 Singapore was founded in 1836 by New Yorker Oshea Wilder who was working as a land surveyor in the Michigan Territory. He purchased a plot of land on the coast of Lake Michigan that bordered the Kalamazoo River to the south. There, he built a lumber mill, a general store and barracks for his workers. An unreliable legend says the city received its odd name from someone who thought the British colony of Singapore was at the exact opposite point on the globe. Sadly, whoever thought that was off by several thousand miles. Surrounded by virgin forest, Singapore was readily accessible only by water. To the earliest settlers, the endless woodlands must have seemed inexhaustible — a source of work that would last forever. The town began to grow. At its peak, the largest mill could process 60,000 feet of timber per day. From there, it was shipped to Chicago where it would be sent on by train to the rest of the country. Singapore was founded on the edge of civilization. The people there lived a precarious life at the mercy of the elements. A 40-day blizzard in 1842 saw the town completely cut off. The inhabitants faced imminent starvation and death. They were only saved when a schooner, the Milwaukee, was shipwrecked at the edge of town. The ship’s supplies were used to feed the hungry inhabitants. Being on the frontier, Singapore even became a port of entry to the United States. There are records of migrants from Canada, Central Europe, Ireland and the Netherlands arriving here. Dutch settlers even made the area their home, founding the towns of Holland and Zeeland a few miles inland. Another aspect of frontier life was “wildcat banks” — the name for unscrupulous institutions that held little or no hard currency to back up the money they printed. At this time, there was no oversight on finances in areas as remote as Singapore. As a result, the Bank of Singapore was free to print its own, worthless banknotes. Mill workers would be paid with them. The only place that would readily accept them? The town’s general store, of course. The turning point for Singapore came on October 8, 1871. The Great Chicago Fire razed the Windy City to the ground. The rebuilding effort led to massively increased demand for timber — timber Singapore was only too happy to provide. In 1873, the schooner O.R. Johnson alone carried six million feet of lumber to Chicago over 57 trips. The mass deforestation of the area around Singapore was the beginning of the end. A fire in that nearby Dutch settlement of Holland further depleted stocks in the area. The wood ran out. Industry left. One of the mills was dismantled and moved brick by brick 280 miles north, to St Ignace in the Upper Peninsula. Without any trees remaining, the dunes began encroaching on the town, threatening to bury everything in sight. People moved away, taking whatever they could. By 1875, Singapore had been abandoned, left to relentless nature. Within a few years, the remains of the city disappeared completely under the sand. Today, the site of Singapore is unexcavated and will remain so for the foreseeable future. It lies on private land; the new owner built himself a grand house on the shoreline across part of the ruins. Every now and again, locals find bricks and nails in the area. These are some of the only remaining clues reminding us of the once-thriving city which now lies forgotten beneath the sand at the mouth of the Kalamazoo.